Without global solidarity, the threats to democracy can seem impossible to solve. 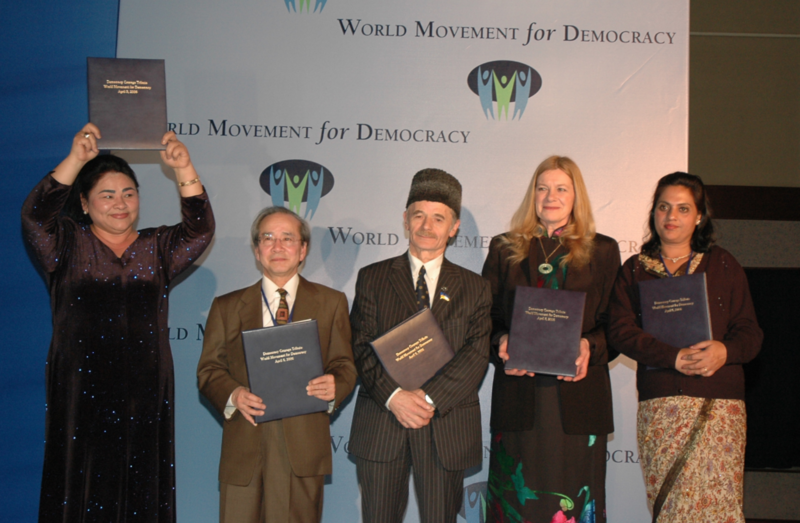 To express and build solidarity, the World Movement for Democracy and the Hurford Foundation present the Democracy Courage Tributes to give special recognition to the extraordinary efforts of groups and movements working under particularly diffi­cult circumstances. Together, we remind one another that we are not alone in our struggles. 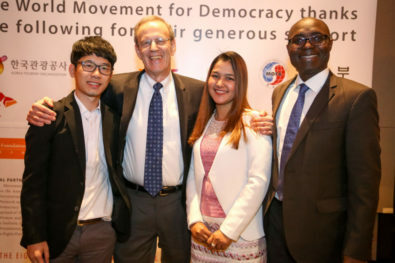 The Democracy Courage Tributes are a highlight of each Global Assembly, and presented at the John B. Hurford Memorial Dinner, which are sponsored by the Hurford Foundation. The dinner was named for the late John Boyce Hurford (1938-2000), an internationalist and philanthropist who played an important role in helping to conceptualize and bring into being the World Movement for Democracy. Accepted by Raffy Lerma and Ezra Acayan of the Nightwatchers. The Nightwatchers are a group of photojournalists take the “night shift” to capture and publish images which bring the disturbing reality of Duterte’s war on drugs to light. 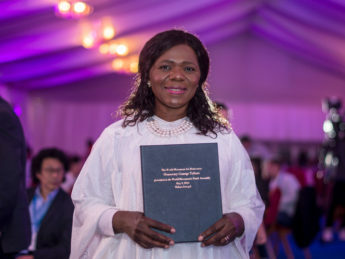 Accepted by Thuli Madonsela, former Public Protector of South Africa (2009-2016). Over the past year, advocates for the rule of law in South Africa, Kenya, and Liberia have displayed true independence in holding fellow government leaders accountable and protecting the integrity of democracy. 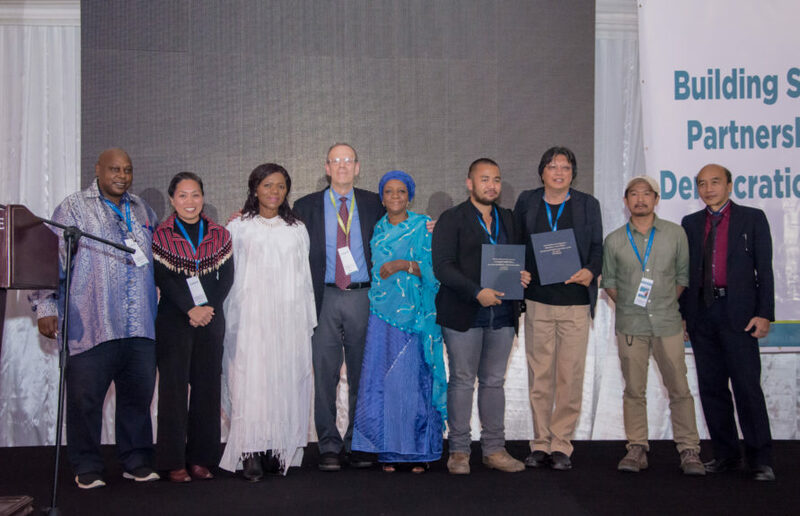 With this Tribute, the World Movement wishes to recognize both the engaged members of civil society and the courageous defenders of democracy within government institutions who remain committed to transparency, integrity, and accountability in Africa. Accepted by Jin Bianling, the wife of Jiang Tianyong, a political prisoner who was detained and forcibly disappeared by Chinese authorities. On July 9, 2015, Chinese state security forces arrested, detained, disappeared, and forcibly questioned more than 300 human rights lawyers and legal activists in a widespread repression which would later be known as the “709” crackdown—one of the largest coordinated suppressions of human rights defenders in decades. With this Tribute, the World Movement remembers and honors the resilient human rights lawyers of China who defend others at great personal risk. Accepted by Nathan Law Kwun-chun, secretary general of the Hong Kong Federation of Students. The Umbrella Movement’s bold call in the fall of 2014 for a free and fair election process to select the city’s leaders brought thousands into the streets to demonstrate peacefully in Hong Kong. Accepted by Wai Wai Nu, founder of the Women’s Peace Network in Burma. 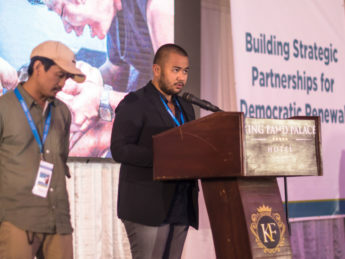 Groups such as the Women Peace Network have worked courageously with and on behalf of the Rohingya people, building their political awareness and calling international attention to the systemic discrimination and human rights abuses they face. Accepted by Rafael Marques de Morais, renowned Angolan investigative journalist and founder of Maka Angola. In Africa’s hostile environment towards journalists, a number of brave individuals have managed to break through the bonds of censorship and corrupt media practices to score victories for freedom of the press. 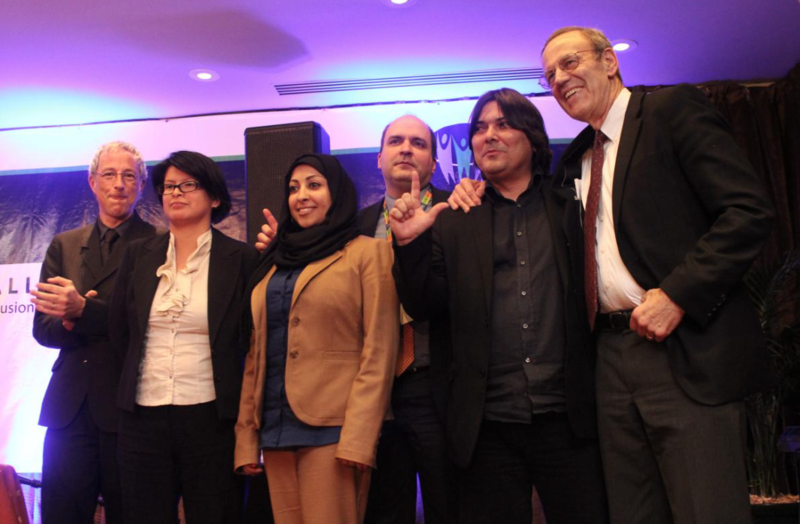 From left to right: Steering Committee member Antoine Bernard (France); Veronica Ferrari (Peru), who accepted the Tribute for Advocates of Sexual Minorities Worldwide; Maryam Al-Khawaja (Bahrain), who accepted the Tribute on behalf of Bahraini Human Rights Defenders; Steering Committee member Carlos Ponce (Venezuela); Regis Iglesias (Cuba), who accepted the Tribute on behalf of the Pro-Democracy Movement in Cuba; and National Endowment for Democracy president Carl Gershman (United States). Messrs. Bernard, Ponce and Gershman presented the Tributes to the recipients from Peru, Cuba, and Bahrain, respectively. Accepted by Maryam Al-Khawaja, co-director of Gulf Center for Human Rights. On February 14, 2011, Bahrainis engaged in mass protest to speak out against their country’s monarchic regime, demanding that state authorities respect human rights, institute democratic reform, and recognize the equality of all Bahraini citizens. The protests crossed sectarian lines and drew thousands into the streets, but were put down one month later when Bahrain invited armed forces from the Gulf Cooperation Council countries to assist in quelling the mass uprising. Although the regime launched a commission of inquiry and promised restitution to victims of the violent crackdown, the commission has proved largely ineffective at best and disingenuous at worst. Prominent human rights defenders such as Abdulhadi al-Khawaja and Abdul Jalil al-Singace remain in prison, while others, such as Nabil Rajab, Zaynab al-Khawaja, Maryam al-Khawaja, and Muhammad al-Masqati, are subject to constant harassment and intimidation. Nevertheless, these brave individuals remain at the vanguard of Bahrain’s democracy movement, calling for peaceful political dialogue, democratic reform, and reconciliation. Accepted by Veronica Ferrari, president of Homosexual Movement of Lima. In the face of violence, discrimination, and other forms of harassment, advocates for the rights of sexual minorities worldwide have demonstrated courage, creativity, and perseverance in their struggle for LGBT rights and equal citizenship. Organizing one of the most important civil rights struggles in the world today, these advocates often face tremendous difficulties in advancing their agenda given that there is much less global consensus on the issue of sexual equality and privacy rights, as many people continue to argue that personal, private sexual identity is something the state, or a particular religious group, has a right to regulate or control. Yet advocates for the rights of sexual minorities continue to defend the rights of LGBT individuals and challenge conservative attitudes despite tremendous personal, professional, and physical risk of injury. Together they have worked to form a truly global, transnational network that transcends borders and traditional understandings in order to advance the rights of minority individuals in societies where the majority has denied the minority the same claims to equality and privacy. Despite tremendous repression of political dissent and a culture of fear in which ordinary people and independent-thinking Cubans are afraid to speak up, a wide spectrum of organizations and individuals located inside Cuba continue to advance democracy and human rights. Together comprising the pro-democracy movement in Cuba, these activists work at great personal risk to themselves. Pro-democracy activists are routinely imprisoned, detained, terminated from their jobs, and otherwise harassed, oftentimes before they even commit any one of the many crimes that make legal dissent nearly impossible. Under a “dangerousness” provision in Cuba’s penal code, the state is allowed to imprison individuals on suspicion that they might commit a crime in the future. In the past year, two great democracy activists, Laura Pollán and Oswaldo Payá, died under strange circumstances. Yet Cuban advocates for change continue to take advantage of whatever space is afforded them however small, using new technologies to circumvent government censorship and finding innovative ways to collaborate on advocating about issues of citizen concern in order to appeal to ordinary citizens. 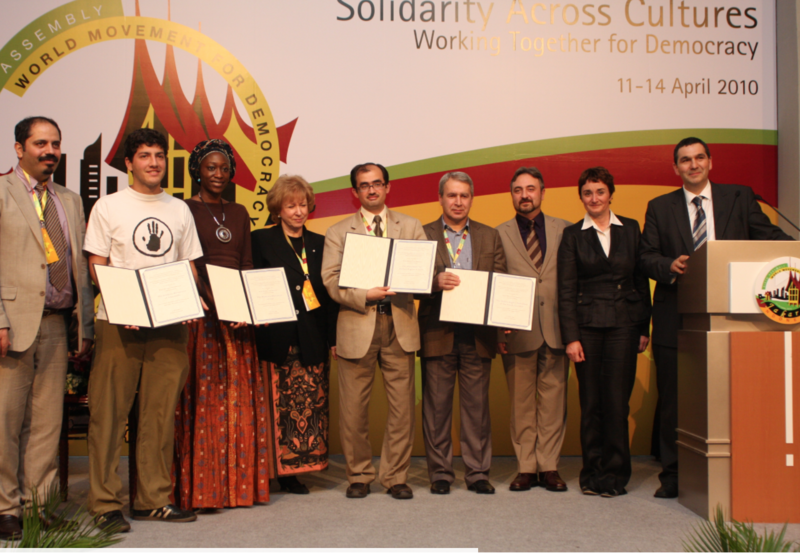 Democracy Courage Tribute recipients pictured with World Movement Steering Committee Chair Rt. Hon. Kim Campbell (Canada), who chaired the John B. Hurford Memorial Dinner, as well as World Movement Steering Committee members, Igor Blaževic (Bosnia), who chaired the Democracy Courage Tribute presentations, Yuri Dzhibladze (Russia), and Jana Hybášková (Czech Republic). They are joined by Ali Afshari of the Iranian Democratic Student Association. Accepted by Radian Ziadeh, executive director of Syrian Center for Political and Strategic Studies and founder of the Damascus Center for Human Rights Studies. In 2009, Syria threw hundreds of democratic activists in prisons, where they joined Syrian dissidents asso- ciated with the 2005 Damascus Declaration for demo- cratic reform. The Declaration called upon democratic forces to undertake “a salvation task of change that takes the country from being a security state to a civ- il state.” Democrats in Syria today face a climate of impunity where government security forces arbitrari- ly arrest, detain and torture critics of the regime. This diverse and courageous movement struggles to return Syria to the days before the current regime took power in 1963 when the country had free media, an indepen- dent parliament, and strong democratic institutions. Accepted by Roberto Patiño, student movement supporter and co-founder of the Caracas Mi Connive Movement. When President Hugo Chavez attempted to legiti- mize his authoritarian rule by amending Venezuela’s Constitution in December 2007, a non-partisan stu- dent movement rose up to defeat it. Inspired by the nonviolent philosophy of Dr. Martin Luther King, Jr., the movement had mobilized earlier that year, holding peaceful demonstrations across the country to protest the government’s closing of the country’s oldest and most popular media outlet. The student reaction to the TV closing and referendum to amend the Constitution was motivated not by political ideology or partisan politics, but by the notion that “in a democracy all sides should be welcome.” Despite government provo- cation and calls for physical attacks on students, the movement continues to focus on the peaceful promo- tion of democracy by training observers to monitor elections and encouraging young people to register to vote. Accepted by Ali Afshari, Iranian activist and student leader. Beginning with their participation in the constitu- tional revolution of 1906, Iranian women have struggled courageously and steadfastly for equal treatment under the law. The regime that came to power in 1979 nullified the legislation that gave women the equal rights they had worked for decades to achieve. Through years of struggle the women’s movement has gained political maturity; the success of the movement became apparent to the world when years of organiz- ing and campaigning brought the women’s networks to the forefront of the prodemocracy demonstrations leading to and following the 2009 elections. Despite persecution, they continue their struggle with dignity, courage, and perseverance. Accepted by Dokka Itslaev, Russian human rights defender. The human rights situation and conditions for human rights defenders in the North Caucasus have become increasingly alarming and violent since the brutal murder last summer of Natalia Estemirova. Abducted from her Grozny office at the human rights group Memorial, Estemirova was found shot dead later the same day in neighboring Ingushetia. Threats, inci- dents of intimidation, and murders directed against activists and journalists in the region continue with impunity. The targets of this violence are Russia’s best hope and moral conscience. They keep alive the possibility that Russia will one day change course, turn its back on extreme nationalism, address the severe internal problems that threaten its well-being, and embrace the values of human rights and the rule of law. 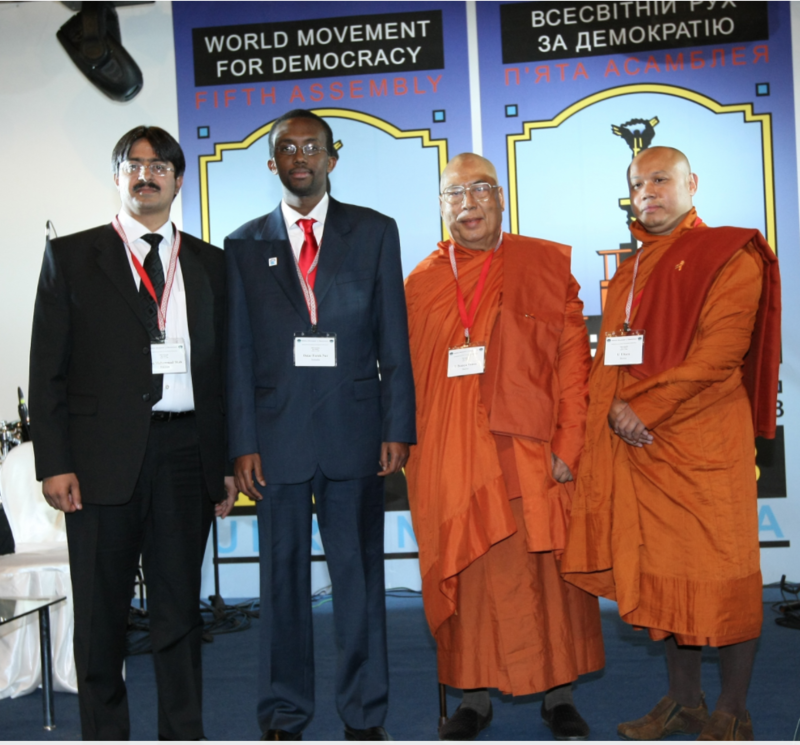 From left to right: Syed Muhammed Shah (Pakistan), receiving the Tribute on behalf of the Legal Community of Pakistan; Omar Faruk Osman (Somalia), receiving the Tribute on behalf of the Independent Journalists of Somalia; the Venerable U Uttara and the Venerable Sawyadawgyi U Pannya (Burma), receiving the Tribute on behalf of the Monks of Burma. To speak out against the treatment of impoverished Burmese citizens, revered Buddhist monks led peaceful demonstrations throughout Burma in July and August 2007. The monks became a powerful symbol of the ruling junta’s loss of legitimacy when they began to refuse alms from members of the military and support political reconciliation in the country. Although the demonstrations were met with a brutal crackdown by the Burmese junta, the monks’ peaceful protests sparked the world’s hope for a democratic transition in the country. In March 2007, Pakistan’s then President and Army Chief, Pervez Musharraf, triggered the most severe crisis of his tenure when he fired the Chief Justice of the Supreme Court, Iftikhar Mohammad Chaudhry. The ensuing lawyer-led protests were unprecedented and met with a police crackdown that was broadcast live. The live video gave ordinary Pakistanis direct evidence of the strong civil resistance and the government’s heavy-handed suppression. The lawyers’ efforts to promote the rule of law and preserve the sanctity of the Constitution have provided the inspiration and momentum for a broader democratic movement in Pakistan. Independent Somali journalists face deadly threats in their line of work, often with little to no local support. In 2008, seven Somali journalists were killed in targeted assassinations. Somalia has experienced a recent and growing widespread state-sponsored crackdown on freedom of expression – the government has shuttered print and broadcast outlets, stolen equipment, detained journalists, and accused independent stations of siding with anti-government insurgents. 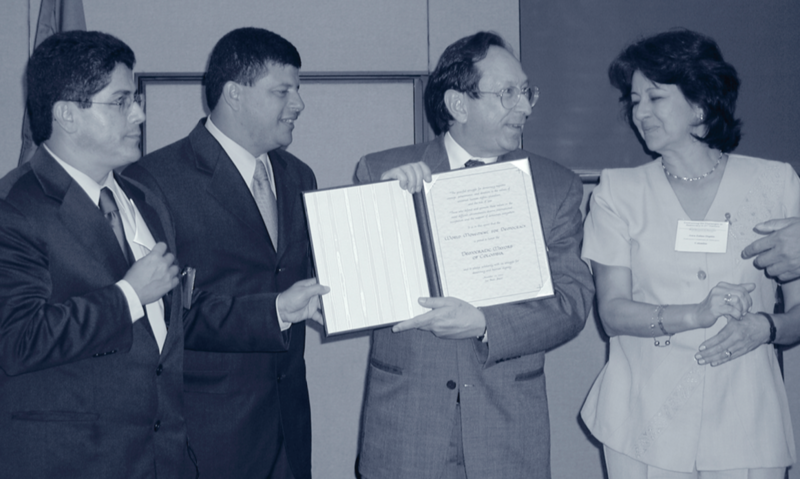 Recipients of Democracy Courage Tributes, from left to right: Vasila Inoyatova, receiving the Tribute on behalf of the Human Rights and Democracy Movement in Uzbekistan; Vo Van Ai, receiving the Tribute on behalf of Democracy Activists in Vietnam; Mustafa Djemilev, receiving the Tribute on behalf of the Crimean Tatars and their Mejlis (Parliament); Penelope Faulkner, also receiving the Tribute on behalf of Democracy Activists in Vietnam; Puspa Bhusal, receiving the Tribute on behalf of the Civil Society of Nepal. 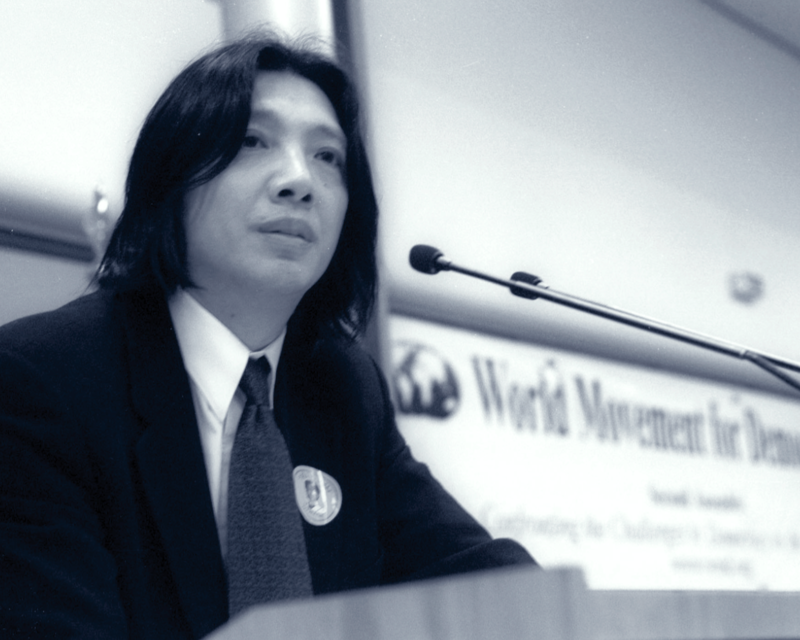 Hoang Minh Chinh, a former high-ranking member of the Communist Party, and Buddhist dissident Thich Quang Do, Deputy Leader of the Unified Buddhist Church of Vietnam, spent over 25 years in detention for his non-violent advocacy of religious freedom, human rights, and democracy. Even from prison, these men and many others like them from both the secular and religious communities have dared to disseminate messages defending human rights, increased pluralism, and the rule of law in Vietnam. Accepted by Krysztof, Uzbek Activist. members of the political opposition parties Free Peasant’s Party, Sunshine Uzbekistan, Erk, and Berlik. Accepted by Puspa Bhusal, Nepalese Activist. From 1996 until 2006, Nepal was besieged by one of Asia’s deadliest conflicts that resulted in more than 10,000 deaths. In the decade and a half since its democratic transition, Nepal has struggled to contend with both a Maoist insurgency and a repressive and anti-democratic monarchy. Nepal’s tenacious civil society, which must work in the limited space between the Maoists and the monarchy, continues to fight to re-establish the democracy. Accepted by Mustafa Djemilev, former Chairman of the Mejlis of the Crimean Tatar People and a member of the Ukrainian Parliament. The Crimean Tartars fostered a new democratic culture through their self-governing parliamentary body “Mejilis.” Soviet dissident, former Chairman of the Mejilis, and member of the Ukrainian Parliament, Mustafa Djemilev is recognized as the leader of the Crimean Tartar National Movement and their struggle for democracy in Crimea, Ukraine. Ayo Obe presents Courage Tribute to the Mano River Union Civil Society Movement. Accepted by the Mano River Union Civil Society Movement. Uniting more than 40 groups from Liberia, Sierra Leone, and Guinea, members of the Mano River Union Civil Society Movement have demonstrated extraordinary courage in mobilizing for peace and democracy. Despite harassment and torture, they have continued to appeal for peace negotiations among the governments and combatants in the region, and have organized demonstrations and meetings calling for greater respect for democracy and human rights. Among the organizations leading the Movement are the Association of Liberian Professional Organizations, the Press Union of Liberia, the Campaign for Good Governance of Sierra Leone, and the Organisation Guineene des Droits de l’Homme. Irena Lasota presents Courage Tribute to the Democracy Movement in Belarus. Accepted by the Democracy Movement in Belarus. The Democracy Movement in Belarus continues to be heavily repressed for opposing the Lukashenko regime. Belarusians’ elections are rigged, their human rights are violated, and independent organizations are forced to shutdown. The local movement struggling to promote democracy and economic reform is forced to operate in a difficult climate. 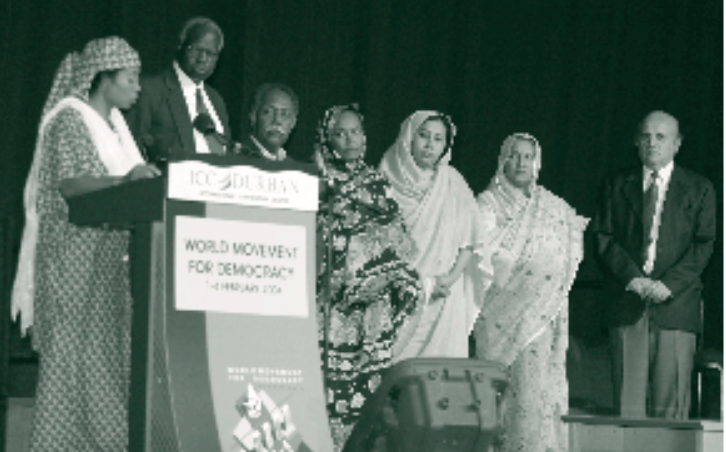 Ayesha Iman presents Courage Tribute to the Democracy Movement in Sudan. Accepted by the Israel-Palestine Center for Research and Information, based in Israel, and to Panorama, based in Palestine. Despite working under challenging circumstances in Palestine and Israel, both civil society organizations Panorama and the Israel-Palestine Center for Research and Information (IPCRI) cultivated a strong commitment to democratic peace. Panorama’s innovative approaches to civic education and youth outreach throughout Palestine sustained optimism for the prospects for Palestinian democracy. IPCRI’s contribution to governance and peace issues affecting Israelis and Palestinians with thorough research, training, and the outline of policy prescriptions for peace, put the organization at the forefront of the peace process. Colombian mayors accept their Democracy Courage Tributes. Accepted by the Colombian Mayors. Colombia’s mayors have demonstrated a high level of commitment to democracy and extraordinary courage. Over the course of three years, 32 mayors were assassinated, including 20 candidates for the mayoral elections held in October 2000. Their unwavering commitment to keep the democratic hope alive, despite assassination threats to themselves and their families, are an inspiration to their constituents and the world. Steering Committee Member Ayo Obe (at podium) applauds leaders of the Civil Society Movement of the Democratic Republic of Congo. 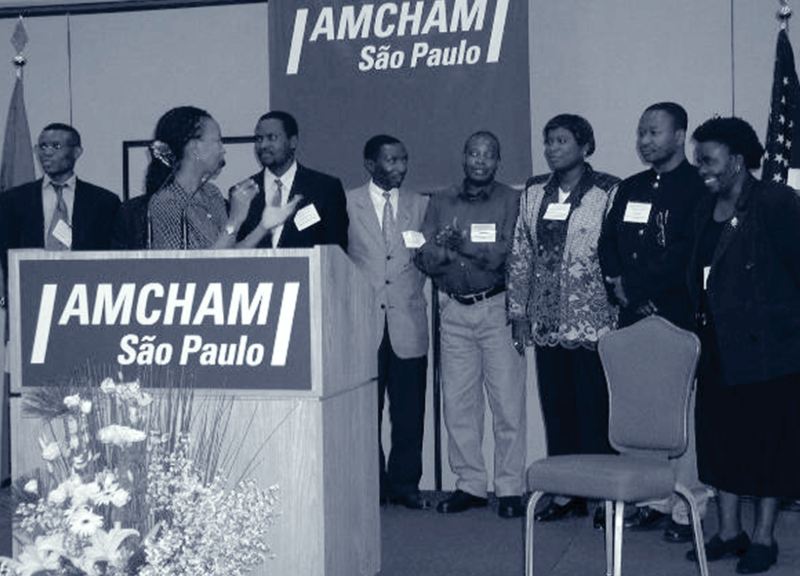 Accepted by the leaders of the Civil Society Movement of the Democratic Republic of Congo. The Civil Society Movement of the Democratic Republic of Congo, composed of thousands of faith-based organizations, human rights groups, and members of the independent press, was a beacon of hope in a country enmeshed in one of the world’s largest and most destructive wars. 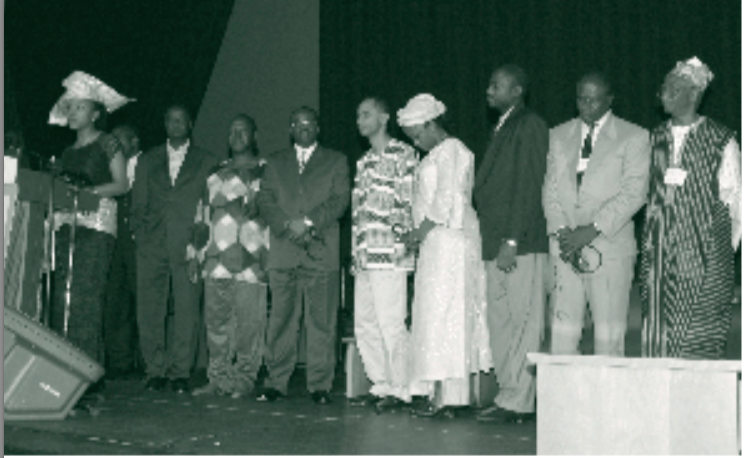 In the 1990s, after the country transitioned from dictatorship to democracy, the Civil Society Movement continues presented a non-violent option as an end to war in the Congo. Steering Committee Member Mahnaz Afkhami accepts the tribute on behalf of Iran’s Pro-Democracy Student Movement. 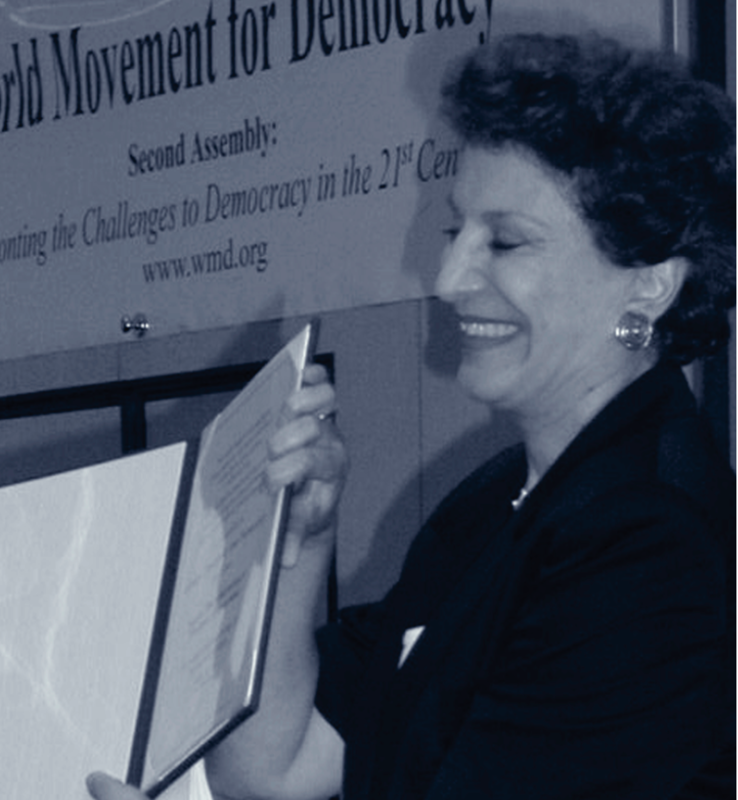 Accepted by Mahnaz Afkhami, former Steering Committee member, founder and president of the Women’s Learning Partnership for Rights, Development, and Peace. The pro-democracy student movement in Iran spearheaded the struggle for basic freedoms in the country. The Iranian government targeted members of the peaceful movement with unreasonable search and seizure, incarceration, denial of legal representation, excessive prison terms, and torture. Steering Committee Member Xiao Qiang accepts the tribute on behalf of the Tiananmen Mothers. The Tiananmen Mothers Network played a crucial role in advancing the idea of accountability for human rights abuses in China. Founded in the aftermath of the June 4, 1989 massacre in Beijing, the network has made extraordinary efforts to illustrate an accurate picture of what happened by documenting the cases of people who were killed or wounded. It has provided moral support for the victims’ families and pursued unprecedented legal action. 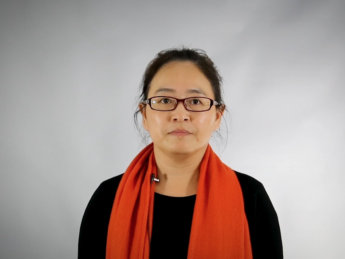 The network’s founder, Ding Zilin, the mother of a victim of the massacre, has suffered enormous persecution for her insistence on speaking the truth and calling for an end to impunity. Steering Committee Member Irena Lasota looks on as Zulekikhan Bagalova accepts the Democracy Courage Tribute for the Chechen NGO, LAM. Accepted by Zulekikhan Bagalova, member of LAM. 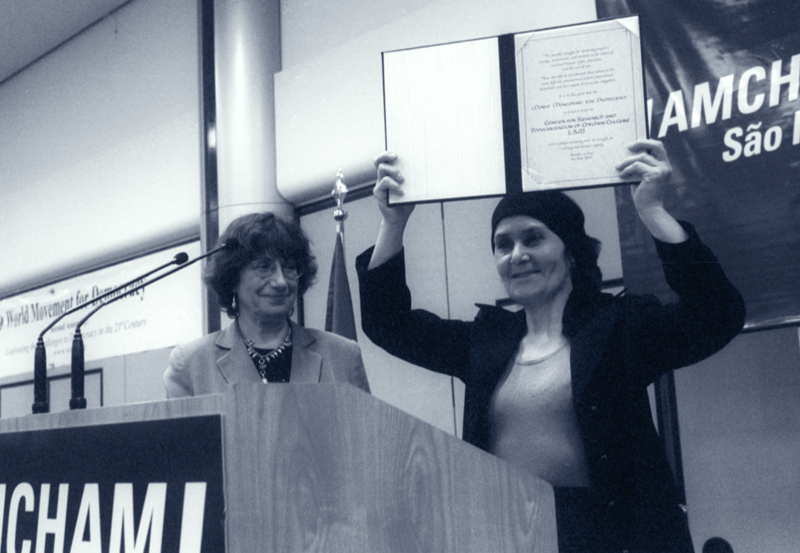 LAM, a Chechen NGO, was founded in 1996 to promote education and human values. 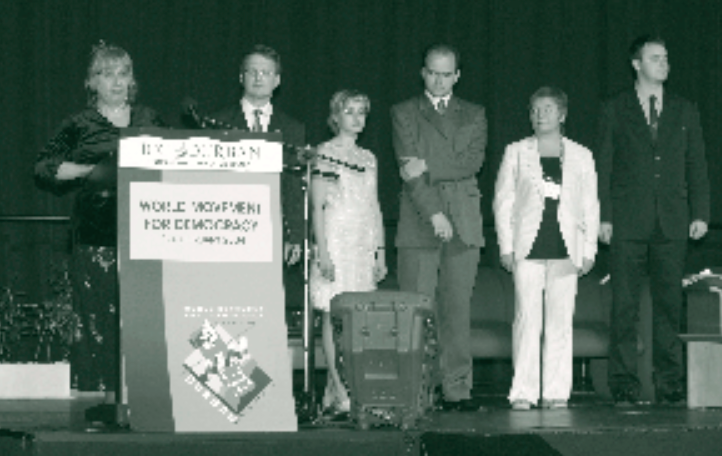 With the out- break of the second war in September 1999, LAM (“mountain”) broadened that role to assist refugees, provide informa- tion to relief organizations, dissemi- nate bulletins about rights abuses to the outside world and bring Chechens from across the political spectrum together to develop plans for ending the war and for post-war reconstruction. Despite the brutal conditions under which it operates, LAM continues to organize demo- cratic education programs in schools and in refugee camps.